Just One Line experience as a whole includes social and online competition features. You may think of the world where your characters live as one instance of many others. If you want, you may compete with other JOL players all around the world in our online leaderboard. You can access the leaderboard by talking to the innkeeper. It is also possible to visit the leaderboard webpage: always at your fingertips, wherever you are! How does the leaderboard system work? Play the game as you normally would. When you think your character is too old to keep saving farmers and killing filthy monsters, make them resign. Once your character resigns he/she is gone, forever, but you will be able to submit them to the leaderboard when prompted and assign them a title from the many he/she earned. If your character dies on quest, on the other hand, you will not be able to submit him/her. Thus, the leaderboard system embraces an all-or-nothing model. 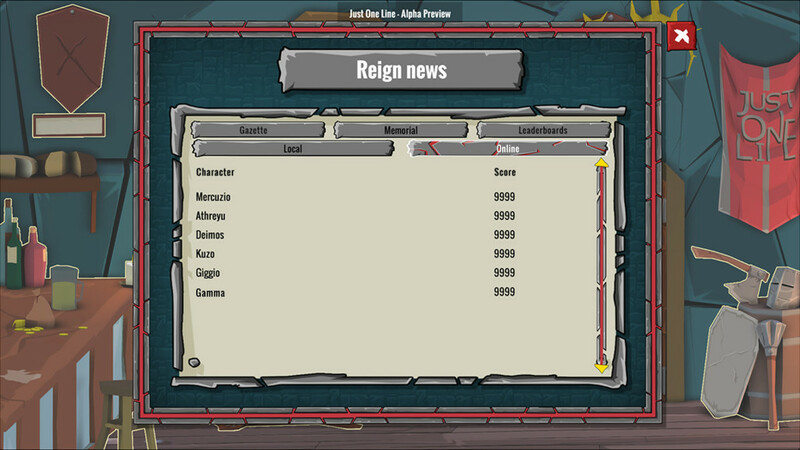 Once your character is on the leaderboard, he/she will be assigned a score based on their statistics (renown system). When browsing the characters on the leaderboard you will be able to access their data such as their statistics, the title you choose them to be remember with, and last but not the least their aesthetics and equipment. Will your character be the most renowned of all time? The most evil? The most honorable? The richest? Once in awhile, we will also start time framed mass events during which you will be able to participate to a themed competition.